There’s a reason we all experience a little bit of fear every time we open a kiln of freshly fired bisqueware. 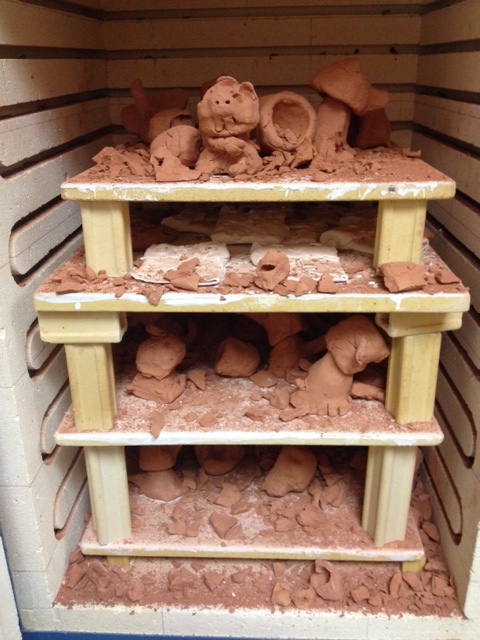 Yeah, that’s a kiln full of 2nd grade animal bobble-heads. I wasn’t present when the kiln was opened, but this picture was sent to me. Devastating, to say the least. Although I felt I had given them adequate time to dry out, it’s clear that I did not. Amazingly enough, 10 out of 26 of the bobble-heads survived. My favorite is that little beaver up front, completely intact, innocently gnawing on his stick, oblivious to the carnage that lies behind him. Even more amazing, every single head survived. Every. Single. One. Like I tell my students, every time we work with clay, you never know. You just never know. I had the same thing happen this year. Yikes!! Love your blog! I killed a whole load of kindergarten dinosaurs once. I now go by the rule of thumb- nothing thicker than my thumb, and I hold it against my cheek to check. If it still feels cool, it’s not dry enough. Your hand can’t feel it but your cheek will. Ooh, thanks for the cheek tip. The bodies were made from pinch pots, so I don’t think they were too thick, especially since I checked every pinch pots’ thickness after they were made, but you never know. I have a kiln fully loaded as of today….. just couldn’t make myself turn the kiln on. I just wasn’t 100% sure they were all dry enough… I’m giving them a long extra 3 day weekend before I fire on Monday. I am so so sorry that happened to you. I know how your kids are going to feel and how long you have worked on these clay projects to begin with. 😦 So sorry. I go through the same thing every time I fire a kiln. Are you sure it wasn’t air in the clay and not the drying time? Nope. Not sure it all. It was strange to me that only the bodies blew up, and since they were made from pinch pots, I wonder if the kids accidentally sealed up the opening. I didn’t think to check before I loaded them. That would very well be your issue! If they may have messed up and smashed their ball of clay up a few times, folding it over on itself, creating air pockets (however small they may be) even if it looks hollowed out and like everything is dry those many tiny air pockets will expand and explode… if hollow spaces are enclosed, a pinhole must be made in the piece to allow gasses and trapped air to escape, otherwise you’re going to open your kiln to a big mess. I teach ceramics 1, 2, and 3…..I have an art degree, although I never took ceramics in college! I had to teach myself and learn everything by trial and (a lot) of errors. I guess what in trying to say is, I feel your pain! I second the cheek tip! Also, did the hollow bodies have holes poked in them? I always tell my kids to do that. It doesn’t have to be big – just need to go through to the middle. Since I fire a lot, I usually put a batch of dry pieces on top of the kiln while I’m firing another batch; that way the warmth from the kiln will dry out any remaining moisture and ensure no explosions when I actually fire that batch. I rarely have explosions any more! Just make sure the pieces you put on top are bone dry because if they’re just leather-hard the heat may cause them to crack. The bodies weren’t hollow like you’re thinking. They were inverted pinch pots, so unless a student accidentally sealed up the bottom, there shouldn’t have been a need to poke a hole. The ramp hold has saved me! No explosions in years. It makes sure everything really is dry. I feel your pain. I started candling my electric kiln with one burner on low and the lid propped open overnight. Then firing very slowly the next day. So far, just one blown up duck and that was due to the student not putting a pin hole through an enclosed air space. Clay is tough if it isn’t your speciality. I did specialize in this and even still it’s rough with little kids and construstion techniques. I do use my cheek. It’s hard on little kids to wait for things to dry. They just don’t get the waiting. I do a hand check during construction to insure they are not covering up pockets. FYI the strapped air thing is a myth. Its the water that condenses in the pockets that actually causes explosions. Clay is poreous, so if you fire it slowly enough the air will escape. Preheating your pieces as Jenn suggests will save a lot of pain. Good luck and fire on. Thank you. I always explain to my students that we try to control clay as much as possible, but ultimately, you just never know. Then I follow with tips on how to ensure that we are doing our best to get the results we’re hoping for, but again, weird things happen sometimes. I’m planning an update post today, and I”ll let you know how the students reacted. “Things that can cause clay to explode in the kiln” is always the most popular question in my year end quiz. Still… even knowing all the possibilities, it’s such a bummer opening the kiln to the carnage of potshards. I Laughed Soooooo Hard when I saw this photo! I teach high school sculpture and ceramics & work in clay all the time. I’ve gotta say, Ive NEVER had that bad of explosions – hilarious I must say – but a few. 1.Dry greenware until room temperature when held to cheek. 2. Preheat all the ware for a long time if you kiln can “hold” otherwise do what the person said above- prop kiln open with stilt and turn on low. I would not, however, run it through the night with it open. I would do this when in school during the day & shut off overnight.